Dae-Ho Lee was the only small surprise from pre-camp estimations of the Mariners’ roster makeup as the club Sunday settled on the 25 players who will begin the season Monday in Texas at 1:05 p.m. PT. The Mariners put 40-year-old RHP Joel Peralta on the major league roster, among eight moves Sunday, none surprising, to reach the mandatory 25-player limit for Opening Day. Seattle begins the regular season at 1:05 p.m. Monday against the Texas Rangers at Globe Life Park in Arlington, TX. In addition to adding Peralta, a free agent signed to a minor league contract Feb. 9 from the Dodgers to patch the bullpen, the Mariners designated for assignment C Rob Brantly; re-assigned to the minors RHPs Blake Parker and Donn Roach, INF Efren Navarro and OF Daniel Robertson. Placed on the 15-day disabled list were LHP Charlie Furbush and RHP Evan Scribner, retroactive to March 25. Already on the 60-day DL were RHP Ryan Cook and C Jesus Sucre. Other than injuries to the relievers that forced the Mariners into adding Peralta and RHP Nick Vincent, acquired from San Diego last week, there was little change from most pre-camp estimations of the roster makeup. LHP Mike Montgomery made the roster as a reliever, instead of a starter, where he performed erratically last year after joining Seattle. 1B/DH Dae-Ho Lee, a 33-year-old rookie from South Korea, did well enough in the field and at the plate to land the platoon job at first with Adam Lind, forcing the the cut of Jesus Montero. Lee joins another newcomer, Luis Sardinas, 22, as the backup infielders. In the outfield, Franklin Gutierrez, limited by health, is the only real backup, as Seth Smith and Nelson Cruz will rotate among DH/LF/RF positions. 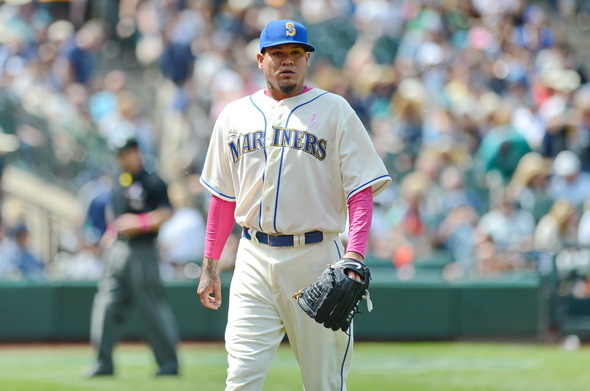 In Monday’s opener, RHP Felix Hernandez will face Texas lefty Cole Hamels. Hernandez is 6-0 with a 1.49 ERA in eight Opening Day starts. Hamels went 2-1 with a 4.00 ERA against the Mariners last season.